Over three years ago, I had the most astounding experience of my life. Facing my own mortality, I knew that if I could tell just one story, this was the book I had to write. I self-published We Are One Blood: Honouring the Body’s Right to Heal Itself. And then, I went back to my day job. Last week, I saw Anita Moorjani, author of Dying to Be Me, give a talk in Kelowna, BC. In her book, she details her healing from stage four cancer following an extraordinary near death experience. I related to Anita’s description of the aftermath. How does one go back to ‘normal life’ after such an experience? She, too, had fears of judgment and while she wanted to share her magnificent story of the truths she’d experienced firsthand, she was a bit shy about revealing her full identity. No one wants to be mocked, called ‘delirious’, or disappoint people in respected circles. She laughs about it now, as she stands on the stage in utter, admirable confidence, firmly voicing what she knows for a fact, because she lived it. Anita isn’t out to convince anyone, and neither am I. But people are clearly curious, and comforted to learn about what lies beyond death. During my near death experience, the veil to the spirit world was lifted. Communication with the other side became easier for me. Facilitating conversations with spirit for others came naturally. I felt completely and utterly called to help people in this way. While physically and emotionally recovering (and in need of rent money), I focused my energy on my reliable profession, an arena that requires certain boundaries that don’t include woo-woo. Anita’s recent talk has given me fresh courage to come out of that professionally-suppressed closet, and proclaim “I see dead people”. I’m now peeling off those thin layers of fear that have accrued over the last three years. Dear public, I am ready. Thank you, Anita Moorjani, for demonstrating your courage, expressing your voice, and reminding me why it’s so vital I stand up now and present the real me to this world. It seems that the busier I get with work, the more I lose touch with who I am. Even when I really enjoy my job and identify with a shared corporate mission, I feel like my true self is taking a back seat. I fall into bad habits: laziness and food addiction. I give so much of myself to the company all week, I want to be pampered as compensation. On weekends, I nap during back-to-back movies. I munch on chips and chocolate, and have dinner delivered. Then I feel guilty, because I’m not really DOing anything with my time off. I beat myself up for making unhealthy choices. And that’s not who I am. In current society, it’s acceptable to gauge what we DO with a higher value than who we ARE. We’re expected to do things that have a (sometimes arbitrary) financial figure attached to it. This further translates into possessions we own as a marker of our value in society. What we contribute through doing, is greatly impacted by who we are being. Who I am, is more about the qualities inherent in my soul. Despite my physical or mental capacities, or what I choose to do moment-by-moment, these traits remain everlasting. So today onward, “I am” is my mantra for hitting the reset button when I get lost in the forest of DOing. I am convinced that by continuously asking myself, “Who am I?”, I can ensure I am consciously realigning with my life purpose as I veer and stray off the path of the intentional life I desire to live. I go to a writing group first Monday of every month. We’re given arbitrary words, subjects or ideas to spark a spurt of writing. This month, we were asked to imagine we can submit into a kind of lottery, an email that will be randomly selected to be sent to one million people. In the final phase of preparing my first book for publishing, I took this writing exercise very seriously. This is what I wrote. The book, We Are One Blood is now available on Amazon. Annette Erickson, the writing group’s facilitator, has written the first review. In my previous post, I wrote about a job that arrived at virtually the same time that I was given the opportunity of free office space to test trial some new business ideas. The old, fearful me, took the job with optimism, knowing that “in this economic climate” (yada, yada) I ought to have a secure stream of income. I shoved doubts to the back of my mind. I looked for only the bright side, and reminded myself constantly to focus on the essential money I’d be earning. On my fourth day, after receiving a blatantly revealing (negative) email from my predecessor (about how the employer had not paid him for two months), I had severe doubts about the employer. It occurred to me that they may not pay me either. Since I did not have a contract, no letter of employment, not even a time sheet as evidence, I began to worry that this company was dodgy. It also began playing on my mind that I’d noticed the office girl bending the truth to people over the phone. On my fifth day, I walk in, and sure enough, I’m told, “It’s not working out”. The universe had presented me with two options: the old path of taking a job (that probably wasn’t really right for me), and support in starting a new venture (with the risk of the ‘unknown’ and all possibilities at my feet). I took the easy path as my priority. Today, the universe just slapped me in the face and said: “Wrong choice. But we’re giving you another chance.” This time, I have to make it work. I have this office space. I have support. I have to do this. I guess it really does matter that you do what’s really right for you. Because if it isn’t right for you, it isn’t right for them, either. I’m considering this “job loss” a lucky escape. Watch now, as I leap into the unknown Abyss! I’ve lived in Merthyr Vale since 2002 (save for a year in Penarth, and 7 months in Cardiff). People I meet here frequently ask, “Why did you come to Merthyr Vale?” There is no short answer, so here is the long one. In November 2001, my then partner, Darren, and I decided to get away on one of our “magical mystery tours”. Just point the car in a direction, and go wherever it takes us. We aimed west, and as we got to the Severn Bridge, the sign for Tintern caught our attention. We veered left and followed the winding road to this beautiful place. Exploring Tintern Abbey, I had this very deep sense that this was my ‘home’, a place I longed to return. It was intense, committed, beyond my control. (The previous post, Closing the Door on Tintern Abbey, further describes that whole story separately.) We spent 1 night at The Wye Valley Hotel. I remember visiting the castle at Chepstow, and staying in a hotel in Barry for 1 night. I was completely obsessed with the idea of moving to Wales after that. I just could not settle. Finally, in August, Darren agreed to go on another weekend away there. In my mind, it was to get clear whether Wales was where I wanted to be, or not. We went to Tintern again, stayed at the same hotel. Then drove on to Caerphilly. I loved Caerphilly. To me, it was the perfect place to live: a modern town, with an ancient castle in the centre, and beautiful countryside surrounding. Even Darren seemed to warm to the idea of this town as a new place to live. We ended up in Malvern for 1 night before driving back to Essex. During the drive home, I remember playing a John Denver CD. When the song Country Roads came on, the words: “Country roads take me home to the place I belong…” triggered such emotion, tears streamed down my face and I knew I had to go back to Wales. As soon as we got back, Darren, who had previously vowed he’d never leave Essex, made the necessary phone calls to his employer and arranged a job transfer to the Cardiff branch within 4 hours. We had 5 weeks to move! It worked out well, as our house lease was just coming to an end. I tried to work with letting agents by phone and email to arrange a place, ANY place, in Caerphilly to live. No help. We decided to widen the search to Cardiff. We even took another trip and viewed a few places. We settled on a flat, an agreement was approved, and then shortly thereafter, the owner decided not to let. Getting desperate, Darren said to find a place anywhere, just not Merthyr Tydfil. I meditated, and every time I did, all that ever came up was “Merthyr”, “Merthyr”. It whispered, it haunted. The house was a Victorian mid-terrace on the side of the valley, with a high wall in front. It had a massive living room, high ceilings, and very old fashioned carpet, golden brown bathroom fixtures. The house on the left was derelict and boarded up. The house on the right was owned by a kind widower named Glynn and his terrier. (Coincidentally, the house we left in Essex, next door was a kind widower named Joe with the same breed of terrier!) The rent was £300 a month (less than half the £650 we paid for a smaller place in Essex). A bit nervous, I signed the lease on 47 Brynteg Terrace. We moved the day before Darren was due to start his first shift in Cardiff. I was pleased that at least I knew 1 person in Wales. The day we moved in, John phoned me to say he was moving to Cornwall… the very next day! It felt as though, on some level, his job in Wales was done. I was now there, to ‘take over’. We loved the house, despite its melancholy feel. Through the huge living room window, we looked across the valley to a cemetary. It took me 2 weeks to understand that the cemetary we faced was where the children of the 1966 Aberfan disaster were buried. I soon began a job as a casual library assistant and attempted to ask people about the incident. I quickly learned that there was still so much intense emotion about it, that people were unwilling to discuss it. Those who know me well, know that I sense the energy of places and 47 Brynteg Terrace had quite a history of family life. Although I could not verify it, I sensed in more recent times there was a woman guardian of a young man who had mental health issues resulting from a feeling of guilt around the deaths of his young relatives in that disaster. The woman had issues of her own. She had never visited the cemetary to grieve. When John returned to the area on a visit, he insisted we walk up to Aberfan cemetary. A spiritual person (we had mused in the past that we had known each other in a previous life as monks of the same order), John was certain that I had come to Merthyr to perform energy healing of the area. That is why we were in a house that had residue of guilt over Aberfan; that is why we now had to visit the cemetary. I was reluctant, but I knew that if John didn’t drag me there, I might procrastinate forever. I don’t mind cemetaries at all. I find them rather calm and peaceful. I’ve never hesitated to walk into any. I’ve never felt anything bad in one. The second I saw the first child’s grave, such an intense grieving emotion flooded through me, like I have never experienced in my life! The strange thing was that it was completely impersonal. They were not my feelings. I was like a conduit for previously unexpressed, suppressed emotions. I felt like I was a vehicle through which the entire village was crying for their lost loved ones. I had no connection to any of these people, and yet I was processing their loss through my uncontrollable weeping. I took photos of every grave. I thought I could commemorate these lives somehow; ensure they were remembered, immortalized. But I later decided it was not my place or duty, in fact very much not for me to do. John was really good about this. He just stepped aside and let me do my thing, somehow knowing that this was part of my purpose for being in Merthyr. He later affirmed that this was a tremendous release for the area. That now, it could ‘move on’ in a more positive light. Interesting how coinciding with this, housing prices began to climb, doubling in one year, and now around 5 times the price they were. A derelict house now is rare. Building has been rampant. More people have moved to the area as it has become more desirable. 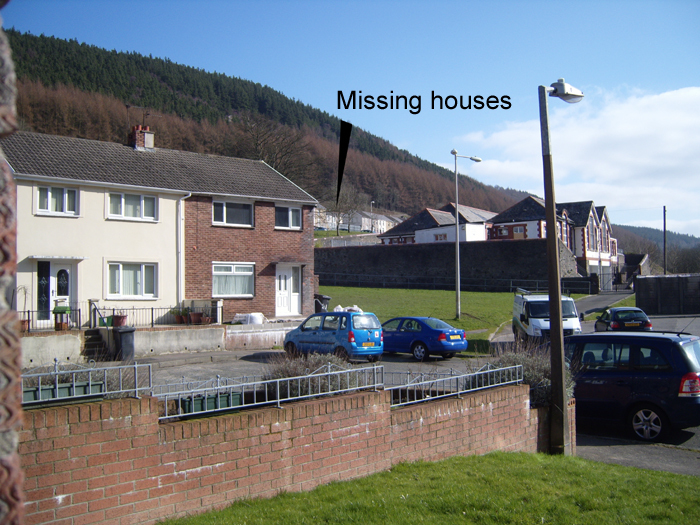 A part of the renewal schemes involved a row of houses, including 47 Brynteg Terrace, being torn down. This is how we were then moved to 42 Mount View in June 2002. When I left my partner early 2008 and moved to Penarth and then Cardiff, I thought I was done with Merthyr Vale. Not so. It felt right to return in January 2010, though I could not entirely pinpoint why. If you read my previous post, Closing the Door on Wales, you will come to a part where it mentions seeing a spitfire flying very low, straight towards me. It seemed to come out of nowhere. I took a quick photo as it came towards me, and one when it was directly above. It was so loud, so close, that it filled the entire photo frame. It then disappeared behind me. I thought nothing more of it, until a few days later. I was driving through Mount Pleasant, and just as I drove past the space between some houses, it suddenly hit me: “Oh my God! Oh my God! The spitfire photos are missing!” The 2 shots of the spitfire did not appear among my photos. The gap between houses is where 2 Canadian piloted spitfires crashed in 1941, and underneath the wall on the other side is where the memorial mural is. When I returned to the house, I looked in the sequence of my photos where the spitfire photos should be. There was only 1 shot, and it was white. Pure white. Empty. Nothing. No data whatsoever. I have never, in the 10 years or so that I have owned this camera, have this happen. I was told that some modern planes can interfere with cameras. But as a spitfire is very old, this is unlikely. Also, there are only 18 flight-worthy spitfires in all of UK, and the nearest I could find listed on the internet were in south of England. About a week later, I did see a news clip that there had been a 75th anniversary of the spitfire flight from Folkestone, Kent (200 miles away, on the east coast of England) on the 5th of March (the following day). I suppose the spitfire I saw may have been from a private collection, or on its way to Kent? I could find no reports of it. It remains a mystery how it could fly so low in a valley over the abbey. In any case, it raised my attention to this mural and its history. I remember some years ago when my next door neighbour, Jeff, told me about this commission and its unveiling, urging me to attend. I meant to go, but, well, I didn’t feel comfortable, for some reason. In the back of my mind, I did think I should look into the story, what with it being about Canadians and all. Well, this is when I learned about that gap in the houses. Funny enough, from my front door, you can see that gap. To read more about the incident, see http://www.alangeorge.co.uk/spitfirecrash.htm. To hear a first hand account on video, watch http://www.youtube.com/watch?v=yuuWilKFQU8. So what does all this mean? I still don’t know! I’m still here, so I there is possibly still some purpose in my being here. I am making efforts to leave. Sometimes, we don’t fully know what the reason is for being in a certain place. At different times, I’ve been drawn to Australia, Arizona, and Iceland. I remember when I moved to Penarth, I thought I could seriously live there for the rest of my life. When I returned from my first holiday in Portugal, I remember looking out my Penarth window, smiling to myself, thinking: “I’ll be living in yet another country someday.” Three years hence, after another holiday in Portugal, I’ve thought of a temporary stint in London or Essex, then going to Europe. Can’t say why. It’s that gut feeling, all over again. I woke up this morning thinking same-old, same-old. What I really need is a change in direction. A big change. Something to commit to. Something that will make me bounce out of bed each morning with enthusiasm and vigour! Something exciting! Something meaningful. For a long, long time now, I’ve just been doing the same thing. Get up, go to the computer, stay on it well into the wee hours, then go to bed. While I love what I do, there is something huge missing. I am still an observer of life, reporting on it, rather than an active participant. Reporting on my thoughts and my life is a great outlet! But I want more to report on! Something Real going on in my life that makes a difference to the wider world. The only way I’m going to get a different result from my life is if I change direction. Today.